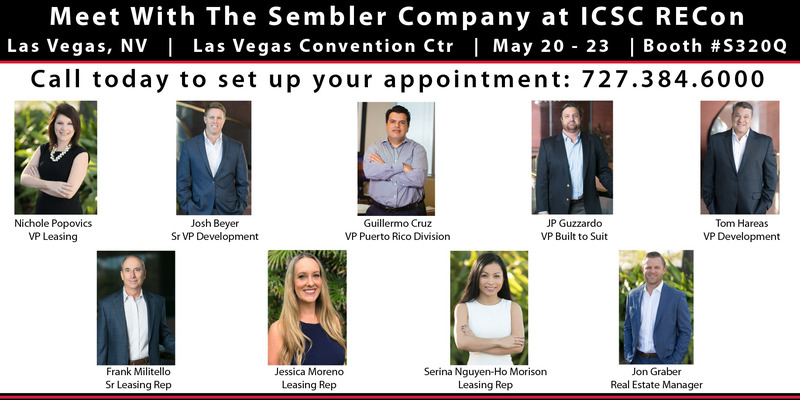 Don’t miss your opportunity to meet with The Sembler Company at this years ICSC RECon “The Global Retail Real Estate Convention” on May 20 -23 at the Las Vegas Convention Center in Las Vegas, NV. This conference is the perfect opportunity to discuss your next retail real estate project with our leasing professionals. Or if you are interested in what we have currently under development, than catch up with the Josh Beyer, Jon Graber, JP Guzzardo, or Tom Hareas to see what we are currently working on! If you’d like to make an appointment to meet with our team in Las Vegas click here. If you need more information about the RECon please visit www.ICSC.org.